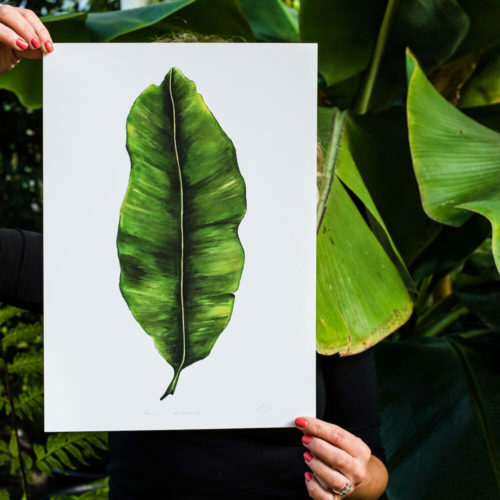 Signed A3 botanical Rubber Plant print – Ficus Elastica. Painted, printed and hand finished in Belfast by Dollybirds Art. Printed onto thick 300GSM IPS uncoated art paper. Part of the inspiring Dollybirds Art botanical collection, getting you one step closer to nature. A wild rubber plant can grow to a mighty 30ft tall. But luckily this beautiful A3 rubber plant print will take just the perfect amount of space on your wall! From original artwork painted with acrylics, this has been printed to a high quality and hand finished in Belfast. The Rubber Plant, or Ficus Elastica, is one of the most popular houseplants with its waxy look and contrasting colours. The leaves range from light and dark green to pink. The large leaf gives a bold touch to an interior. This Rubber Plant print would be well placed where your eye naturally falls, such as next to a fireplace or a doorway. The same goes for a real rubber plant too, but make sure it’s not a cold spot as this is a tropical plant! Including plants and plant motifs indoors give us that important connection to nature, to make you feel at ease. Intensify the impact by placing this print besides the others in the Dollybirds botanical collection. Each print comes with a little plant fact on the label. Click here to see other Dollybirds Art prints. Signed A3 plant print, printed onto thick FSC certified 300GSM IPS uncoated art paper. Fits into a standard frame. Posted flat, in a sturdy hard backed cello envelope. Items are usually shipped within working 3 days and posted by 1st class Royal Mail. I’m happy to arrange international shipping upon request. Please contact shop@chalkandmoss.com for a quote before placing your order. Your order will be sent directly by Dollybirds Art (who receives your name and address), as instructed by Chalk & Moss. Standard Chalk & Moss returns policy applies. Eimear Maguire of Dollybirds Art is one of those people who you just can’t help but want to spend more time with. Her passion and excitement for life, nature and her art shine through and reflects beautifully in her art. Since 2013, Eimear has been making beautifully lifelike prints of flora and fauna from her Belfast studio. From botanical prints to indigenous birds, she brings the joys of the natural world to our homes. These include hand painted puffins, swallows, cheese plants and banana leafs, printed to a very high quality within 10 miles of the studio. Many pieces are of archival quality, guaranteed to last a lifetime. Each piece is signed and printed on FSC certified paper.